Chief Master Sgt. John Gebhardt cradles a young Iraqi girl as they both sleep in the hospital. The girl's entire family was executed by insurgents. The killers shot her in the head but she survived. The girl received treatment at the U.S. military hospital in Balad, but cries often. According to nurses at the facility, Chief Gebhardt is the only one who can calm down the girl, so he holds her at night while they both sleep in a chair. Chief Gebhardt was assigned to the 332nd Expeditionary Medical Group at Balad Air Base, Iraq. Chief Master Sgt. 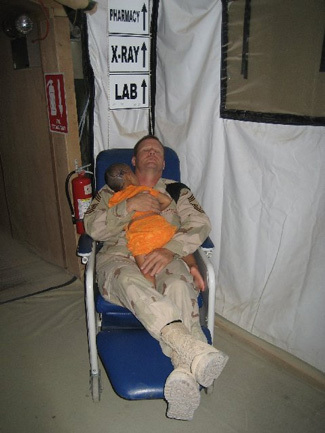 John Gebhardt, superintendent of the 22nd Wing Medical Group here, recently gained worldwide attention for a photo of him holding an injured Iraqi child. The photo was taken about a month ago, while he was deployed to Balad Air Base in Iraq. The young infant had received extensive gunshot injuries to her head when insurgents attacked her family killing both of her parents and many of her siblings. The chief had a knack for comforting her and they often would catch a cat nap together in a chair. Now, he is back at home in Wichita, Kan., with his wife, Mindy. They have a warm, hospitable home five minutes away from McConnell Air Force Base. His son Ryan, 25, and daughter Amber, 23, have long since outgrown being cradled and he said he thought about them constantly while he held the Iraqi child. "I got as much enjoyment out of it as the baby did," he said. "I reflected on my own family and life and thought about how lucky I have been." The chief was not alone in volunteering at the hospital. There were more than 800 different volunteers at the hospital during the time he was deployed to Iraq, he said. Some of them volunteered so much that he mistakenly thought they were assigned to the hospital. And it is the chief's hope that families in Iraq will receive the same kind of support in the future. They are just like American families, Chief Gebhardt said. "I pray for the best for the Iraqi children," he said. "I can't tell the difference between their kids and our kids. The Iraqi parents have the same care and compassion for their children as any American." Sadly, other than CNN, none of the television networks has bothered to cover this marvelous story. Somebody pass me a tissue.